How to write chemical equations in HTML? Royal challengers Banglore is one of the most strongest IPL teams. The team has demons like Chris Gayle, Virat Kohli, AB Devilliers and Shane Watson who can chase any target. The team has proved its worth and potential by registering a big victory against Rising Pune SuperGiants. Virat Kohli played a brilliant knock of 108* runs that helped Banglore to win the match. But, the ton of Virat Kohli has registered one more record on his name, he equals the record of his RCBian mate Chris Gayle. Both these players have scored two tons in a single IPL season. Chris Gayle achieved this milestone in 2011 IPL season. He scored two centuries 102 and 107* against KKR andKXIP respectively. Virat Kohli has acheived this milestone in the current IPL season by scoring 100* and 108* against Gujarat Lions and Rising Pune SuperGiants respectively. 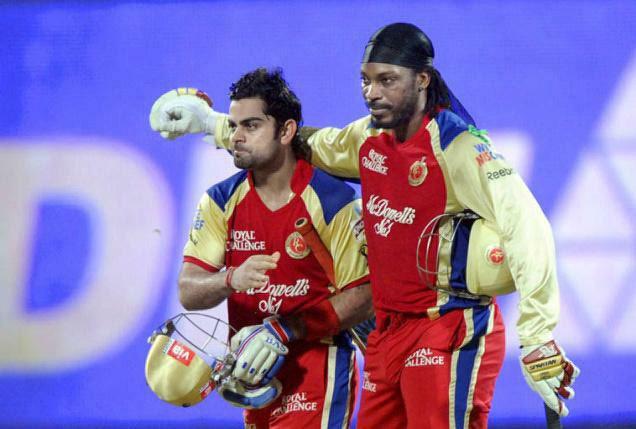 Virat remained notout in both the innings while his mate Chris Gayle remained notout for one time only.